For September's meeting, the Chicago Speculative Fiction Community met up to discuss Neal Stephenson's newest: his 2015 novel "Seveneves". 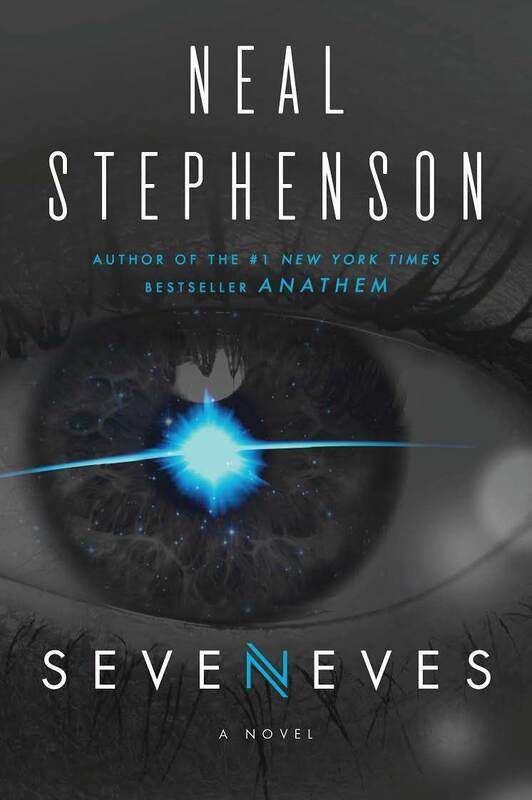 "Seveneves" is Stephenson's hardest and most classically science fictional story to date; the first half of the book is survival-oriented, space-tech heavy, and has a thriller-ish page-flipping quality; the last section is a far-future tale that reminded us a bit of an updated golden age SF adventure, like something by Heinlein or Anderson or the like. General consensus was that this is a smashingly good book, easily one of the best SF novels of recent years, at least. Anne started the discussion with incredibly high praise--"best SF of the new millennium"--and expressed great lamentation when the book was over and there was none left to read. A few of us expressed great hope for a sequel, though Stephenson has not been prone to those. Anne had two critiques/quibbles: how thoroughly personality can be determined by genetics, and that the 7 races would remain distinct for five thousand years. On the latter point, we all found that pretty hard to believe from a practical perspective (going from 7 people to a few billion without any interbreeding between the types); Kim brought up the case of how isolated societies are sometimes more polyamorous in order to avoid excessive genetic bottlenecking, which reminded me of the Star Trek TNG episode "Up The Long Ladder" (1989), which we all remembered as being pretty terrible. Worth a re-watch, though. On the notion of personality being determined by genetics, well, personally I don't find that so hard to believe, particularly with a severely limited and artificially-selected gene pool; see for instance the fairly thorough take-down of "nurture" arguments in Pinker's "The Blank Slate" (2002). Note that he's not saying that nurture has no impact, merely that we overestimate its ability to radically alter mental traits that are essentially set at birth. He gave a TED talk on the book that outlines the main points, and some of those ideas seem to be at play in the Freakonomics podcast "The Economist's Guide to Parenting". Anne's line "We need to kill Julia" got actual applause from the table. Julia--President Flaherty-- is a remarkably effective character, who we all REALLY wanted to kill. I've never encountered a character that evoked that response so strongly. And not because she's annoying, nor a moustache-twirler: Julia is an all-too-convincing composite of the kind of ideological self-brainwashing that unfortunately characterizes too many political figures; thrusting her into this narrative seemed to me kind of a way of dramatizing the science-denialist strain in U.S. politics right now. In the unforgiving environment of space, those insanities have much more quickly-visible results. Paul pointed out the crime boss character in Heinlein's "The Moon is a Harsh Mistress" (1966) who doesn't respect the environment enough to live very long. Chris praised/bemoaned the "this is someone you're starting to like? Oops, now they're dead!" dynamic of the novel. Seriously, almost everybody dies. 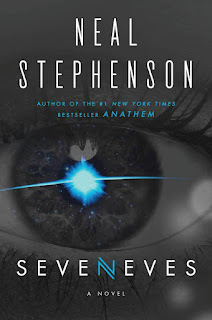 We talked for a bit about the title and preconceptions about the book--knowing Stephenson's love of codes & math puzzles, I was expecting "Seveneves" to have more palindromic things going on. The 5,000 years is a bit of an intentional number, of course--about that many years from human civilization to the disaster in the novel, and then the second part of the book is the same amount of time after. Some of us were looking for title-explaining clues in the initial seven fragments of the moon, and at any rate were so caught up in the action that we kind of forgot about the title until the population is actually reduced to the seven Eves. Kim praised the characterization and action, which really pull one through. She also pointed out that the last section feels more like an extended preview of a sequel than a "second half". This, and wondering how likely he is to write a sequel, led us into a moderately long discussion of some of Stephenson's other works. 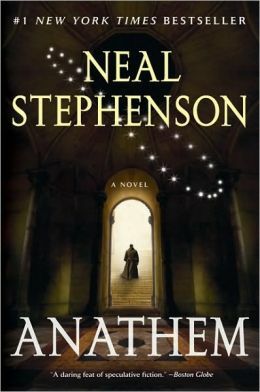 I'm a bit intrigued by some of the connections to "Anathem" (2008), which I find a pretty singular achievement--very much a "novel of ideas", a rare genre--but which lacks the Crichton-y straightforward technothrillerishness of the first half of "Seveneves". I'm also intrigued by some of Stephenson's interest in a kind of libertarian/prepper-culture, most visible in "Reamde" (2011) but really at least a small part of many of his works; the "diggers" here clearly in that tradition (and thus also interesting that he examines the issues of a hierarchical patriarchy rising from that). Mike pointed out the somewhat satirical encyclopedia culture of the diggers: "Sonar Tax Law" bringing to mind the Dr. Who arc "Paradise Towers" (1987, seventh Doctor), which featured characters such as "Bin Liner" and "Fire Escape". Paul also had great praise for the novel qua adventure story, with some technical questions--most of which he was willing to let go for the purposes of the story, but with a lingering one about why all those frozen corpses weren't sampled for genetics. We talked for a bit about heterozygosity and the current state of genetic engineering tech. The past tragedy of the American Elm, the ongoing tragedy of the Black-Footed Ferret, the likely future tragedy of the Cheetah. Gene pool size is important. Bill was knocked out of the book by technical detail, not salveagable even using a fairly advanced skimming technique. Alas! He also brought up the fact that bunkers seem the more cost-effective and logical response to the disaster, which started us off on a long discussion of orbital mechanics, bolide-diversion strategies, and bunker creation/modification. We did wind up conceding that the re-terraforming of Earth is only possible thanks to the space-borne population. Discussion of acute radiation poisoning led us to discussion of heroism and "survival calculus", the number of really grim decisions that are made here, applause for the heroics of some of the characters, and again the refrain, "someone needs to kill Julia", this time for her spinning of the facts. Suggestions made that her character is a combination of Sarah Palin and Carly Fiorina. Led us to talk about other characters with some real-world basis, particularly the Elon Musk-y & Neil Degrasse Tysonesque ones. now that I see this cover/font. 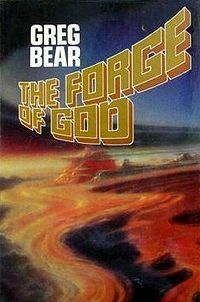 Greg Bear's "Darwin's Radio" (1999) & "Darwin's Children" (2003), for the genetics, and the Earth's destruction by off-screen alien agents in "The Forge of God" (1987). Cherryh's azi, genotinkering & mind-cloning, particularly in "Cyteen" (1988). I made a brief soap-box speech about how well it holds up. Which in turn brings up Ira Levin's "Boys from Brazil" (1976). Paul highly recommends Sturgeon's "When You Care, When You Love" (1962). Some of David Weber's work--I'm not much familiar outside the Honor Harrington stuff, but it sounds like it might have been the "Safehold" series, where humans are kind of hiding from planet-destroying aliens. James S.A. Corey's "Expanse" series, insofar as aliens trying to terraform (xenoform?) Earth might be a thing to worry about. The one I was trying to think of! Robert Reed's novelet "Five Thrillers" (2008), sort of a sociopathic secret agent tale that ramps up into the kind of grim survivor calculus that we remarked on in "Seveneves". Highly recommneded; looks like the easiest way to get that is in Gardner Dozois' "Best Science Fiction of the Year" anthology, 26th edition, or listen to it from Starship Sofa. Much mental-library-searching for comparisons to the tone of the last section--far future, lots of tech but sort of more flippant & adventurous, rather than hard-boiled realism. One of my main comments here is that the last section works by really different rules than the first, and that's okay, just takes a bit of gear-shifting in terms of expectations. I also like the more mythic/epic aspects--the 7 races, particularly Aida's sort of prophecy that her children will be cursed and will hate the others. Space Opera, golden age SF, and even Tolkien-influenced fantasy kind of vibes here at points. Some discussion of Morse code in space (and why it's worth keeping that skill alive) led to Mike sharing the story of continuous-wave Morse operators beating phone-texters on Leno. Discussion of telegraph & communications technology prompted me to talk up James Gleick's "The Information: a History, a Theory, a Flood" (2011), which is a really lovely and highly-readable non-fiction book that weaves together the history of communication technology, information theory, and brief biographical sketches of central figures like Claude Shannon. Mike also praised the book, and then went on to his quibbles/critiques, which mostly have to do with the deep believability of whether or not the Seven Eves & children could survive for very long at all--vitamins and integrated circuits being a key failure point. Much laughter as we realize that there are only seven of us in the room, and thinking about how we would set out to ensure the continuance of all human civilization. But some good discussion of minimum population sizes needed to maintain technological infrastructure to survive in a friendly environment, much less in space. As an illustration: Thomas Thwaites' attempt to build a toaster (and make toast!) from scratch. REALLY scratch. TED Talk, website, and now there's a book about it. Interestingly, these kinds of criticisms (the difficulty of maintaining a functional human society in small numbers & artificial environments) powers Kim Stanley Robinson's "Aurora" (2015); I'm sure it will be much-discussed in connection to "Seveneves". I should mention that I'm a big KSR fan and liked the ideas in "Aurora", the critique of overly easy, optimistic SF futures, but "Seveneves" is by far the more riveting novel. At group we also talked about "2312" (2012), which has many many similarities to "Seveneves", but with very different pacing, style, & scope. Next time, we'll be discussing Alastair Reynolds' "Blue Remembered Earth" (2012). Final postings for November (Windycon) and December should be soon--likely "Hitchhiker's Guide" for the Con, or just possibly "Childhood's End". Keep up with the Chi-SF on Facebook, Meetup, or the Forums. Wow - you did a great job summarizing the discussion. You even remembered the response to someone noting that there were only seven of us in the room - that was a big, hearty laugh! Only one quibble - although I was the one who related the story in the meeting. it was Paul who had greeted me with the words "Somebody needs to Kill Julia! Kill her now!" (He had just finished the section where the Arkies split off from Izzy.) I really sympathized - Julia made me so angry that I STILL haven't been able to read the text of her announcement. Bravo to Stephenson's technique, but Ooooo, how unmitigatedly EVIL do you have to be to place your own petty power games above the survival of your entire species? I don't think I've hated a character this much since Dolores Umbridge.